Aymeric Laporte’s goal right at the end of the first half has given Manchester City the lead over Everton in tonight’s Premier League clash. Liverpool will be hoping for their Merseyside rivals to do them a favour in the title race tonight after their dropped points against West Ham on Monday. But so far it’s not panning out that way, with this superb header from Laporte putting City 1-0 up right before half time. Watch below as the Frenchman produces a towering leap and perfect placement to guide the ball into the corner. 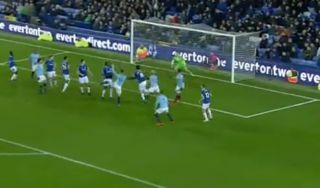 Not the kind of goal you usually associate with City, but still a top quality one – and potentially a hugely important one in the title race.